After a long, cold, Michigan winter, three consecutive days of sunshine and warm temperatures is almost too much. After visiting some of the wildflower patches in Cass and Berrien Counties earlier in the week, I decided to see what was happening up in the Allegan Forest. As I’ve mentioned, the Allegan State Game Area (as it is also called) is not the richest place for wildflowers. The forest here was clear cut over a century ago, after which the land was farmed. Many areas were subsequently re-forested, and some of these have been clear cut since and are now in yet another cycle of re-growth. While prairie wildflowers – both native and non – abound in many of the open fields, the woodland wildflowers can be hard to come by. My plan was to visit the Ottawa Marsh. This unit of the Allegan Forest serves as both a bird sanctuary and waterfowl hunting area. It is not entirely marsh, but is rather a patchwork of marshy wetlands and open fields. In past years I’ve found scattered patches of wildflowers around the marsh. This is one of the few places where I’ve found white trout lily – which is not a rare plant but, locally, is much less common than the yellow variety. It was still pretty early in the season to find many wildflowers in the marsh. I forget that counties just 60 or 70 miles to the south can be as much as two or three weeks ahead of the slightly cooler locations to the north. 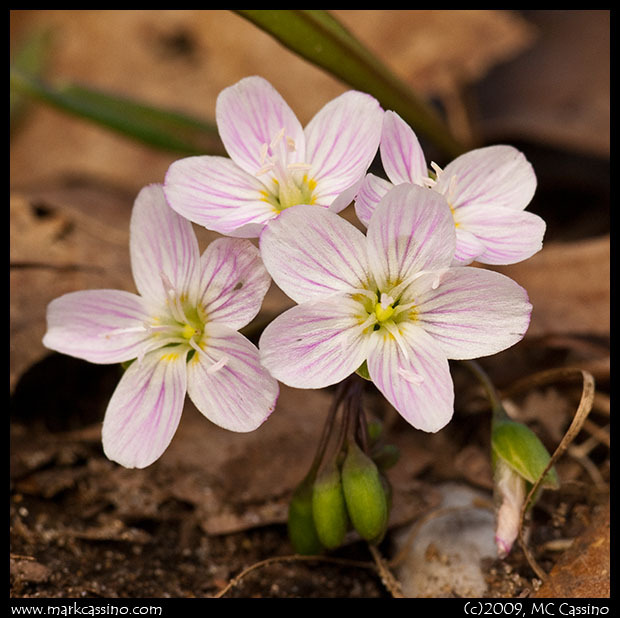 I wandered around the fields and fringes of the far eastern end of the marsh… Aside from a few patches of Spring Beauty, the occasional Wild Blue Phlox, and one or two blooming Trout Lilies (the yellow variety), encounters with wildflowers were rare. The most interesting thing of the day was encountering two large trees, both of which were exuding sweet spring sap from cracks in their bark. I don’t know what kind of trees they were. They were not the familiar suspects – maples, oak, poplar. The bark was light tan colored, lumpy, cracked, and slightly shaggy. I consulted my filed guides but they are all keyed to identifying trees by their leave – which won’t appear for several days at least. I also don’t know if the leaking sap was a natural event, or if these trees were somehow distressed. Whatever it may be, the sap had attracted throngs of insects, including several Mourning Cloak and Eastern Comma butterflies. 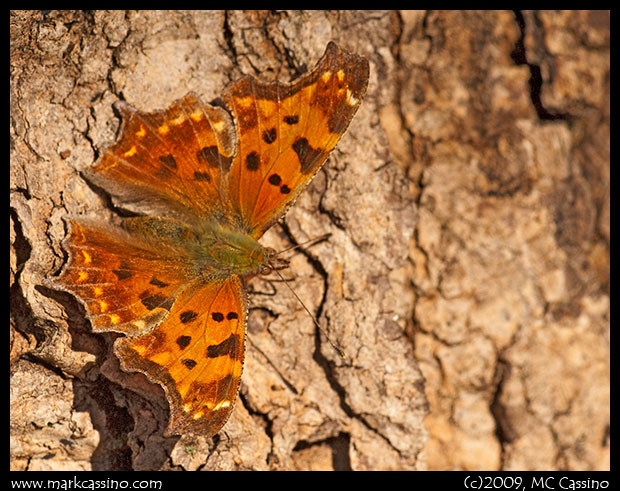 These butterflies overwinter in adult form, and so are among the first butterflies to appear on warm spring days. They no doubt really appreciated the free meal of tree sap. The weather has turned again – and the next several days will be cold, damp, with a rain snow mix predicted. But if those butterflies survived the whole of winter under a flap of tree bark, or in some other nook or cranny, they’ll no doubt sit out the next few cool days, ready to enjoy spring when it finally emerges again.